A friend sent me this on WhatsApp and it got me thinking. All religions basically want you to be good, forgiving, compassionate, loving, humble. If one follows some of this principals then that equates to a good heart. However, in reality we all are human beings and falter somewhere or the other. We all want to be the best or good. Achieving this goodness is difficult. It does not come to you automatically. One has to really work hard at it, be mindful and practice being good. Yes, practice. Practice not to do harmful things. Practice not to say hurtful words. Practice not to get angry. Practice not to hurt someone’s feeling. Practice not to be disrespectful to another human being. Practice to care for someone. If one is able to keep these principals in mind and practice it everyday step by step, the heart feels good, content. Automatically you feel good about yourself and in turn you feel happy, smile more often and learn to see good in everyone. I’m hoping that I’m able to keep this in mind and practice being a better person. Its Monday again and that means a new recipe for the FoodieMonday/ Bloghop group. Our #113th theme is Leafy Greens chosen by Aruna who blogs at Aaharam. She has a variety of recipes but what interests me the most are her Andhra Pradesh cuisine recipes. Leafy greens any vegetables with edible leaves. Right from different lettuces, spring onions, spinach, herbs etc. Leafy Greens play an important part in the Indian Cuisine. We add them to dals, make sabjis, make gravies, add them to parathas, to rice, to other grains etc. The best time to enjoy the leafy greens are during the monsoon and winter seasons when they are fresh and crispy. Some of you may have noticed that last week I blogged 3 recipes from the Caribbean region. 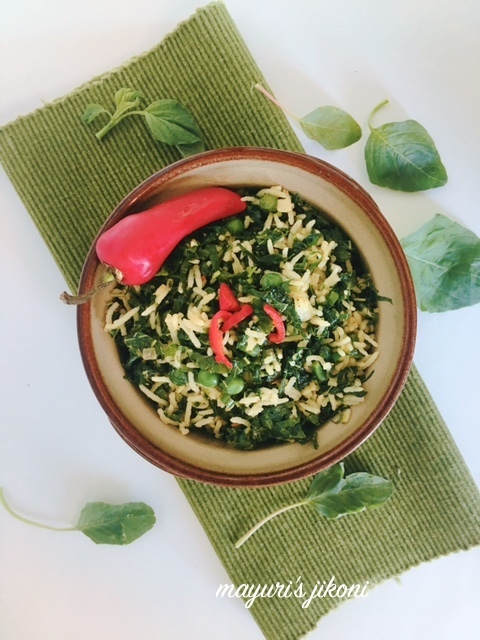 One of the dishes that attracted me was callaloo, initially it was the name itself that attracted me. I had no idea what it was. On doing some research got to know that its amaranth or taro leaves and its made by adding some chillis, onion, tomato, thyme and a few spices. Its a popular dish in Jamaica and other Caribbean islands. Sometimes called spinach. greens or bhaaji by the Caribbeans. The day the theme was decided, the lady who brings vegetables to our door, brought a whole basketful of fresh amaranth. So I knew I was going to use that for my theme. Amaranth, terere, chicha, tandariyo as its also called in my part of the world is full of antioxidants, rich in iron, protein, minerals like calcium, magnesium, manganese, potassium, full of vitamins, high in dietary fiber and provide energy. Instead of just making the callaloo or bhaaji, I made a wholesome meal by making callaloo fried rice. I used up some left over rice and added some vegetables along with loads of callaloo or amaranth. Enjoy this healthy and delicious rice dish with some yogurt or kadhi. Mix the dry spice powders together in a small bowl. Add cumin seeds. When it begins to sizzle, add onion and stir fry till it becomes a bit soft. Add garlic paste and the chopped chilis. Add chopped beans and thyme. Mix well. Lower the heat, cover the pan and let the beans cook for 2-3 minutes. Add the chopped amaranth. Mix, cover and let the amaranth cook for 3-4 minutes or till it wilts. Add the peas, spice powder and salt. Mix well. Add the cooked rice and mix gently. Let it become a bit hot over low heat. Serve with some yogurt or kadhi. Don’t overcook the amaranth leaves. Overcooking greens results in lost minerals and vitamins. Wash greens well as they may be coated with soil, sand grit etc. Amaranth stems do not cook easily so its best to pluck the leaves off the main stalk. Simply wow!Something new I learnt today Mayuri!Lovely recipe! A completely new, healthy and unique recipe. Thanks for sharing Mayuri. Rice looks delicious. Aruna, thanks and exploring other cuisines is always fun and we do find veggie options in them. I loved this healthy rice. Try it Sasmita even with Indian spices. Its a wholesome meal. Something new for me. Love your healthy and unique recipes. Bookmarking it. This looks so good. I love all kinds of green leafy veggies and staying from INdia really miss it. Am so hungry and tempted looking at this.. Absolutely Agree with you, A religion to me also means that we should practice goodness equally. BTW, your Amaranth rice looks fabulous. This is new to me, but sounds absolutely delicious with all the flavors. Please try the recipe, its really delicious and healthy as you mentioned. It was Uma, try it. Jagruti I too love amaranth leaves, in fact any greens. Try out the recipe whenever you get amaranth. That's one veggie we get all year round in Kenya. Veena try it, its delicious and a different way to get more greens in the diet. Thanks Preethi, please let me know how it turns out. I too love my leafy greens. I'm lucky that in Kenya we get amaranth leaves all year round.